Federico Longo studied history in Florence with a focus on the ancient Near East. 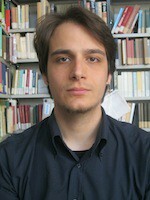 While studying he spent one semester at Freie Universität Berlin for researching his master-thesis topic. Since February 2013 he is doctoral fellow at the Excellence Cluster Topoi in the research group (B-4) Space – identity – locality and the Berlin Graduate School of Ancient Studies within the program “Ancient Languages and Texts” (ALT). His thesis deals with the diverse cultural influences of ancient Hittite magical texts. His main research questions concern the origin of these writings, the method of transmitting ritual motives into the Hittite tradition and which role regional traditions played in the adoption, genesis and dispersion of Hittite ritual texts.